The original Destiny was chock full of easter eggs, so perhaps it's little surprise that Destiny 2 likewise has a few references tossed in for players to find. Even in the beta, players can find one such wink-and-nod in the story mission, "Homecoming". From the hangar, simply head down the stairs and turn to a locked door that would normally lead to the lounge. 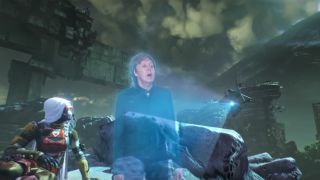 Get nice and close and you'll hear "Hope For the Future," a song written by McCartney to promote the first game, echoing on the other side. McCartney's song was widely panned when it released, and I confess I've no love for it myself. So while this might sound harsh, I suggest we just let the Tower's destruction be the end of this unfortunate melody. Other than this easter egg, are you having fun with the Destiny 2 beta? If you want to make the most of your time, check out our Destiny 2 beta guide. And if you've no interest in playing yourself but want to see what others think, we've got a round-up of Destiny 2 beta reactions for you as well.